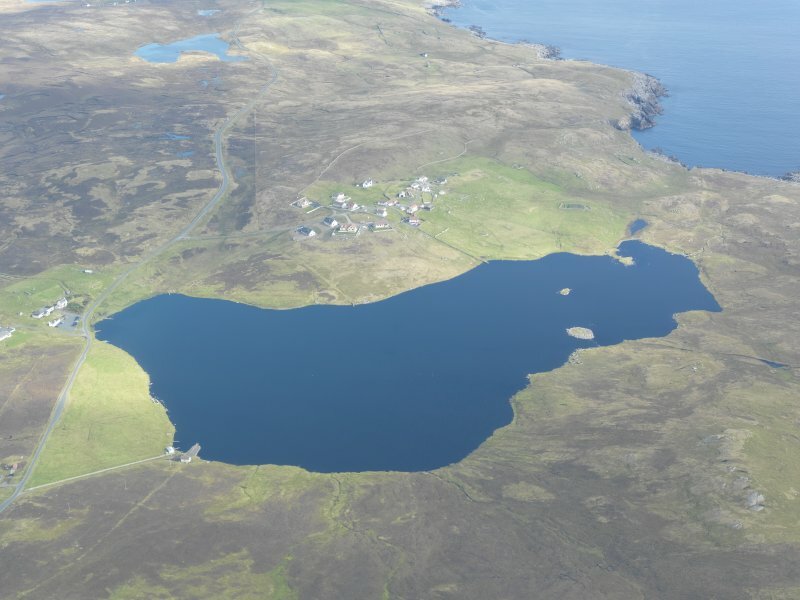 General oblique aerial view of Symbister and Loch of Huxter, looking NW. General oblique aerial view of Huxter and Loch of Huxter, looking NE. 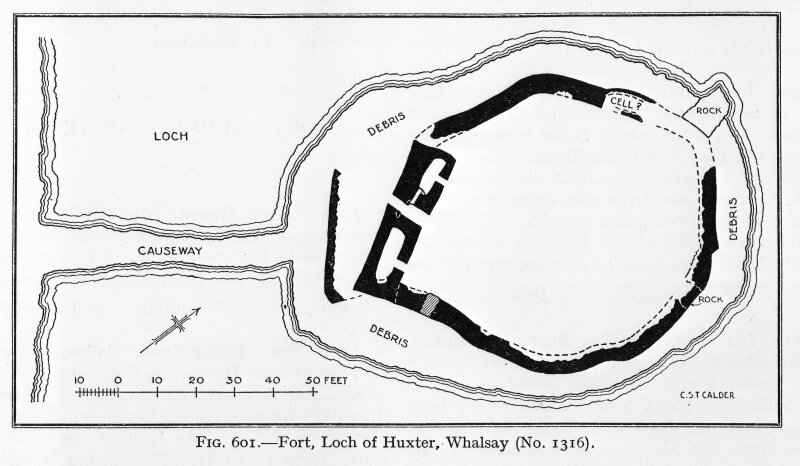 Photographic copy of plan of Loch of Huxter galleried dun. The best-preserved of the three surviving Shetland gatehouse forts, probably datable to about 100 BC (E W MacKie 1965). In 1863 there were indications of a second tier of chambers above the mural cells. A gatehouse fort as described and illustrated. Within the fort are two fairly modern enclosures which appear to overlay enigmatic structures, probably dwellings associated with the fort. Visited by OS (NKB) 27 May 1968; R G Lamb 1980. 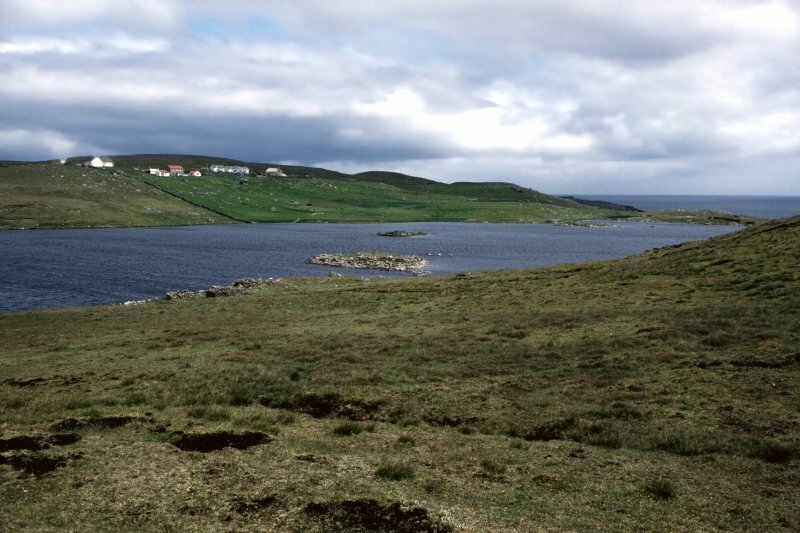 Unexcavated gatehouse ring-fort on Whalsay which stands on an islet in the loch of that name; a causeway about 19.5 m(64 ft) long and from 1.8 - 3.6 m (6-12 ft.) wide connects the site directly with the shore [2, fig. 601]; Mitchell saw the site in 1863 and gives the length as about 30.2 m (99 ft) and he also mentions that it runs obliquely to the shore [3, fig. 1]. At that time stone was being taken from the site to build a school. The islet is almost completely occupied by the fort which consists of a drystone wall 1.2 - 1.5 m (4-5 ft.) enclosing a roughly circular area some 21.4 m (70 ft.) in diameter. This survived in 1935 up to about three course on the north-west but had almost completely vanished on the north-east side. The part facing the causeway consists of a separately built rectangular gatehouse section 12.5 m (41 ft) long by 3.4 m (11 ft) thick; the ring-wall abuts against the northern end of this but at the other end it abuts against the end of the inside face, so that there is a sharp corner there, formed by the front end of the gatehouse. An entrance passage runs through the centre of this section with a large intra-mural cell on either side of this. A low doorway opens from each cell to the fort interior. The chambers -- which Mitchell describes as of 'beehive construction' -- measure (presumably at ground level) 4.27 m (14 ft) by 1.22 m (4 ft) on the southern side and 3.20 m (10 ft 6 in) by 1.07 m (3 ft 6 in) on the south side. The entrance itself is equipped with a door frame about half way down its length and at the door-checks the width increases from 76 cm (2 ft 6 in) at the front to 1.07 m (3 ft 6 in) at the inner end. Behind the left check is a large rectangular hole which lead to the left cell; it is presumably for the draw bar behind the door. The passage is now unroofed and open but in 1963 the gatehouse section was somewhat higher (c. 2.4 m), the passage was lintelled over and there were apparently traces of a second tier of cells above those mentioned. This is perhaps more likely to have been a raised gallery but Mitchell is not very specific about what he saw. No trace of a an intra-mural stair was seen. 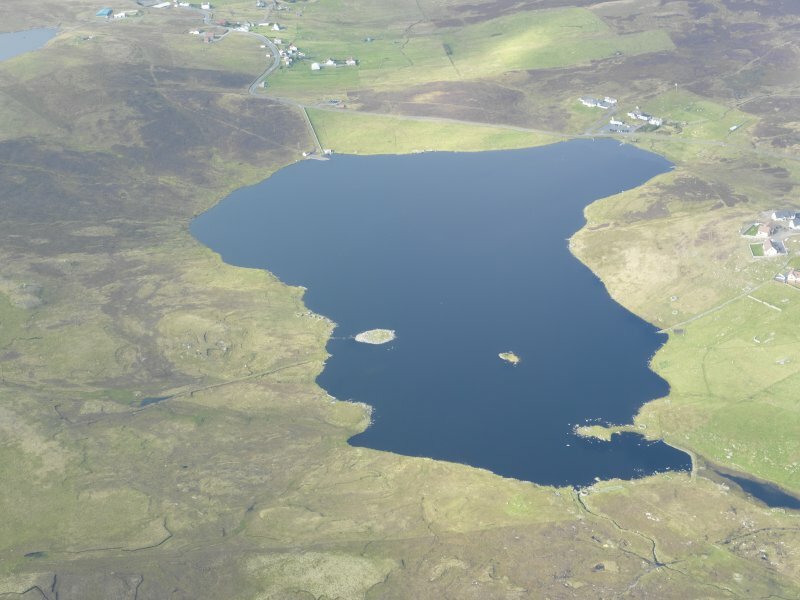 Discussion: Loch of Huxter is of interest because it is not a simple promontory fort like the two closest parallels for the gatehouse section -- Scatness (HU30 3) and Ness of Burgi (HU30 2). The closest parallel for the general plan is with the second ring-fort at Clickhimin as I interpret it but at the latter site the gatehouse section is slightly curved and contains several clear broch-like features which are apparently absent at Loch of Huxter. There seems no reason to doubt that the three classic gatehouse forts are an indigenous Shetland development. Sources: 1. OS card HU56 SE 1: 2. RCAHMS 1946, vol. 3, no. 1316, 83 and figs. 599 and 601: 3. Mitchell 1881, 303-05: 4. Carter, McCullagh and MacSween 1996: 5. Low 1879, 177 and fig..